Melanie Muir comes to Philadelphia from her home in Scotland to share the secrets of her exquisitely constructed bracelets and pendants. 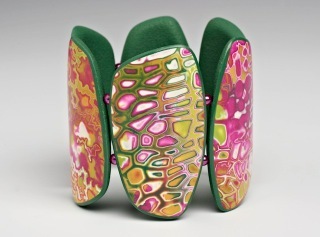 Melanie uses these structures as a canvas for her Mokume Gane designs which she will also demonstrate. She will also show how you can use this structure for your own designs: canework, skinner blends, mica shift, or whatever you can imagine. Melanie is highly regarded as a generous and knowledgeable teacher. Students of all levels of expertise are sure to find value in this two day Master Class. This Master Class will be held at our usual Hillman House location: 22 S 22nd Street in Philadelphia. The class fee of $200 includes some materials that Melanie will provide. The class is open to PAPCG Members Only. Register and pay your dues online at www.papcg.org. Guild Members will receive an email registration PayPal Link in mid January. Any remaining spaces will be opened to all on our website after January 31. Class spaces are limited. Let us know if you have any questions at info@papcg.org. Looking forward to seeing you all at the class!